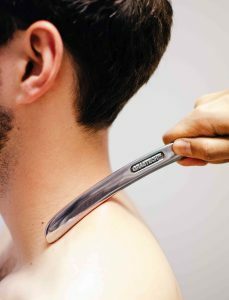 The Graston Technique ® incorporates an evidence-based form of instrument-assisted soft tissue mobilization that enables our Calgary chiropractors to effectively detect and treat scar tissue and restrictions that affect normal function. Our chiropractors, Dr. Alim Kara and Dr. Shereen Kangarloo use the stainless steel instruments to comb over and “catch” on fibrotic tissue, which immediately identifies the areas of restriction. Once the tissue has been identified, the instruments are used to break up the scar tissue, increase the rate and amount of blood flow to and from the area and increase cellular activity in the region. The graston technique will help prevent an acute condition from becoming chronic. The result of treatment is decreased pain and increased function. Graston technique can be used to treat acute or chronic: sprains and strains causing neck pain, low back pain, carpal tunnel syndrome, plantar fasciitis, tennis elbow, golfers elbow, rotator cuff injuries, knee injuries such as patellofemoral disorders, achilles tendinitis, shin splints, scar tissue and trigger points.